Rett began working for MTI in 2006 after enjoying an outstanding internship at one of the company’s clinics. He graduated from the University of Washington with his graduate focus on gait mechanics and analysis. Since then, he has pursued advancements in Orthopedic Manual Therapy, including a residency, fellowship and PhD with the Ola Grimsby Institute. He emphasizes individual rehabilitation programs for recreational and competitive athletes, as well as the desk jockeys and less active individuals. You must be able to break down an activity into small components in order to retrain your body as a whole. An entire systems review is necessary during an evaluation to assess how the body’s parts are functioning as a whole. He appreciates taking a holistic approach including an understanding of nutrition and how the viscera (organs) contributes to dysfunction. 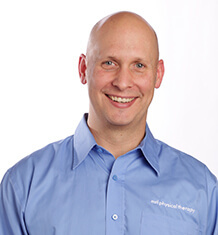 Rett gets his patients back on track, providing guidance for future improvements, and demonstrates enthusiasm for people to achieve their goals. Personal interests include marathons and running, kayaking, hiking, snowshoeing, and cooking (and eating).